Point To Point renewable electricity power solution, OnSite where the power is needed. The Onsite power production systems are renewable and scalable energy solutions for small to large electricity power consumption requirements. The Onsite power production systems can be utilized to support local power substations effectively bypassing transmission lines that are associated with power lose and energy cost increasing. The Onsite AES Power System will help reduce the burden on the present day grid by supporting it where it is most needed. The OnSite independent system (Micro-Grid), will be able to support existing grid structures that are currently in place. The OnSite power solution can provide AC or DC power to supplement the growing demand for energy on an international level, with customized OnSite Micro-Grid solutions. The OnSite power system conforms to industry production standards of electricity as in any normal power generator. The OnSite power system can be designed to provide 100% on demand power and will generate electricity without external input (e.g. fossil fuels such as oil or natural gas), producing economically sustainable clean energy. The OnSite power system can be deign for OnSite power production where the power is needed, significantly less than any other 24/7 power producing energy solutions. The USA existing power structure system is too vulnerable to meet modern challenges — a harsh reality underscored by Hurricane Sandy in the USA which left 8.1 million people in the dark for extended periods. Yet, widespread outages should no longer come as a surprise. The American Society of Civil Engineers gave the USA electrical infrastructure a “D” grade in 2008. Years earlier, a Clinton-era energy secretary described the USA as “a superpower with a third-world grid.” Even though power system vulnerability has been obvious for over a decade, little has been done to address this critical weakness. Any power system overly dependent on centralized generation and long-distance transmission is inherently susceptible to massive failures, and the USA system has proven this. Each day, nearly 500,000 Americans spend at least two hours without electricity, while brownouts and blackouts grind economic activity to a halt — costing the country up to $188 billion annually. Monetary losses from outages will only climb higher in the future. The USA’s current power system is incapable of meeting modern reliability needs as large blackouts are becoming not only more frequent but also more severe. A failure by the U.S. to invest in a 21st-century power system would prove significantly more expensive than the cost of transitioning to a modern power system. The Galvin Electricity Institute estimates that the annual cost of power outages is more than double the annual cost of preventative intelligent grid investments. As long as the nation continues to rely on centralized energy generation and over 280,000 miles of transmission lines, the power system will remain overly vulnerable to widespread failures from accident, weather, and intentional attack. It’s time to invest in a 21st-century power solution, rather than spending hundreds of billions of dollars maintaining a pitifully outdated one. Edwards Air Force base unit has been shipped and being re-assembled. It should be in operation within one month, one more clearance / meeting by the base. The OnSite Power system will lower the cost of power generation and produce power on site at the location. 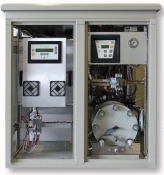 The systems can be designed to meet or exceed industrial quality. The Eco-friendly Power System can reduce or Eliminate electricity cost. No More Black Outs, just pure power. The Onsite Power System is customized and configured for each residential or commercial application as a Eco-friendly carbon negative Renewable energy solution. The Onsite Power System will generate clean energy 24 hrs a day – 7 days a week. Our OnSite Power Systems are more cost-effective than extending transmission power line to the current electricity grid structures. Transmission power lines In remote locations in the USA can cost $15,000 to $50,000 per mile ). Our OnSite renewable energy Systems are a Smarter and Securer Micro-Grid solution, if there’s an accidental power failures it will be central located at individual sites.